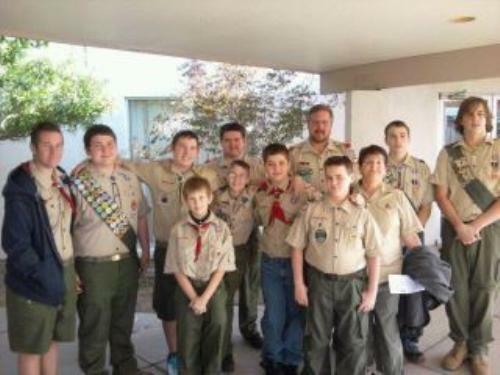 Pictured are the current and past Scouts attending our Eagle Court of Honor. In the back row is our Eagle Aerie presenting the past 5 years of Eagles, including our newest one at the far right. 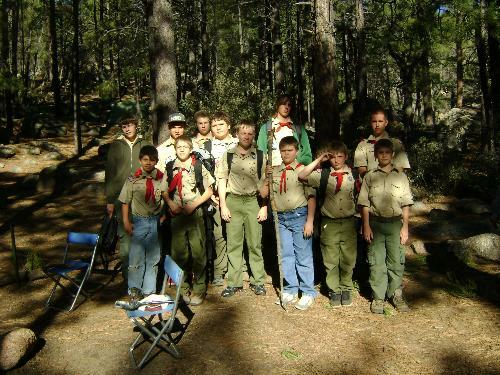 In the front row far left is our likely next Eagle, currently serving as Troop Guide. Our 4 other active Scouts are to his right in the front row. 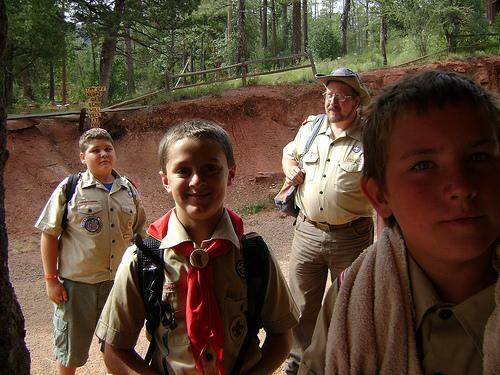 A 6th boy is not pictured. 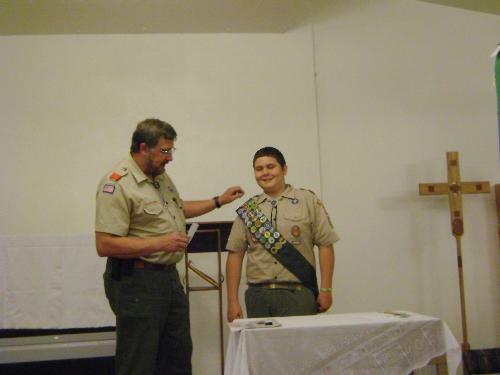 Eagle Courts of Honor are very special occasions because typically only 4% of all boys who join Scouts will ever attain the rank of Eagle. Troop 56 provided the grand finale to the Don Laughlin's Celebrity Theater appearance of Roadhouse, a country-western variety show produced by Venezia Entertainment of Las Vegas, NV. Appearing for 5 nights the boys brought the audience to their feet every single time as the cast came out on stage to finish their tribute to veterans. And yes, that is 'Reba McEntire' and 'Johnny Cash' you see on stage with them. 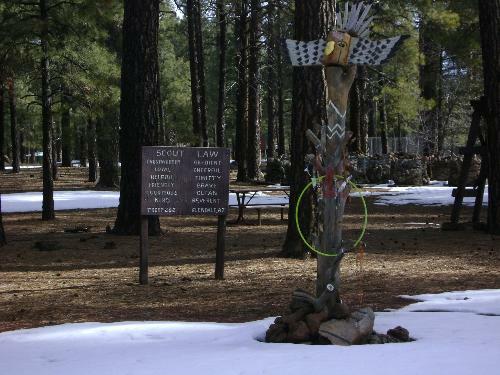 On February 14-14, 2015 4 new youth were introduced to Scouting by attending their first campout at Pirate Cove Resort near Needles, CA. 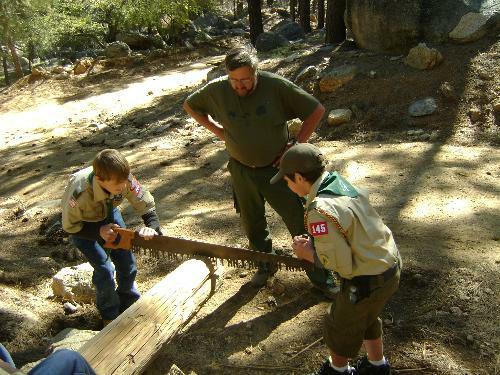 Here they are practicing their new woodcraft skills by putting into practice what they have just learned from their Toten' Chip course (proper use and care of the knife, axe and saw). 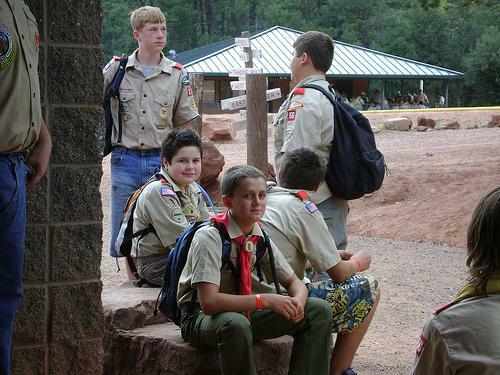 Behind the Scout dressed in blue is the fire ring that will play host to the evening's cooking and campfire. 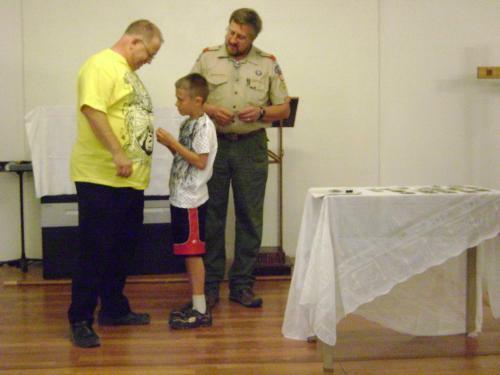 Junior Assistant Scoutmaster (far right) Andrew presents Daniel with his Star rank as Dad looks on. 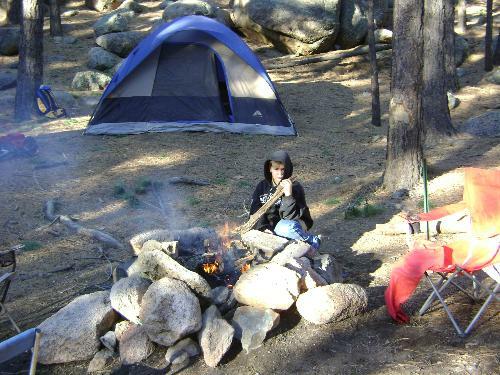 In July 2014 4 Scouts and 2 adult leaders took off for Sequoia and Kings Canyon National Parks for a 4 day/3 night tour. 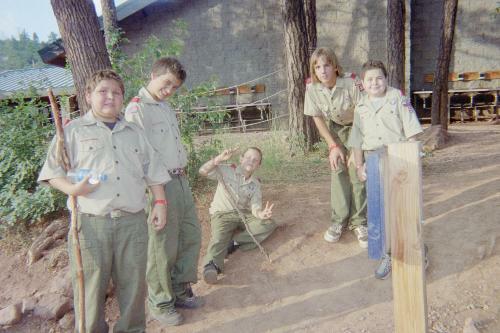 Our newest Eagle (2nd from the right) was along for his last tour before aging out at the ripe old age of 18. 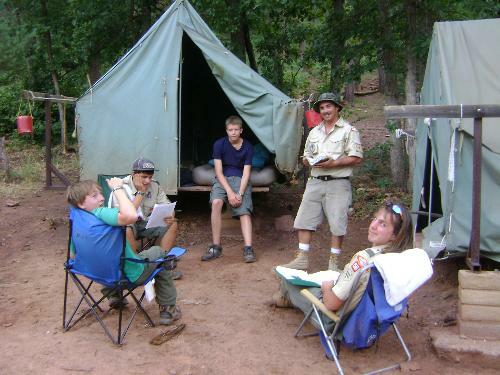 National Youth Leader Training (NYLT) is a week-long leadership program that brings together Scouts from different units to learn by doing. 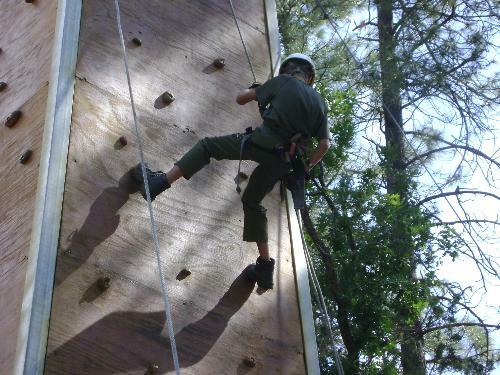 They band together in patrols of 8 boys each and practice patrol method, cooking and eating, playing, building and working together as a team. 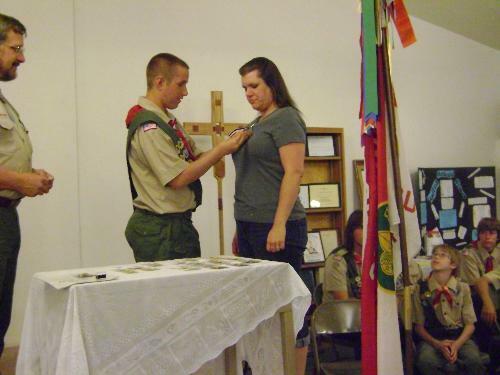 Upon completion of the program the boys are expected to return to their respective units to teach their fellow Scouts the methods they themselves have learned and practiced. 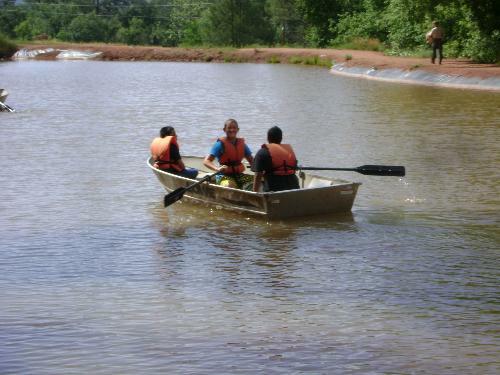 The pictures here were taken upon their graduation from the program. Our 4 newly trained junior leaders, graduates of the National Youth Leadership Training program. Casualties were few (?). 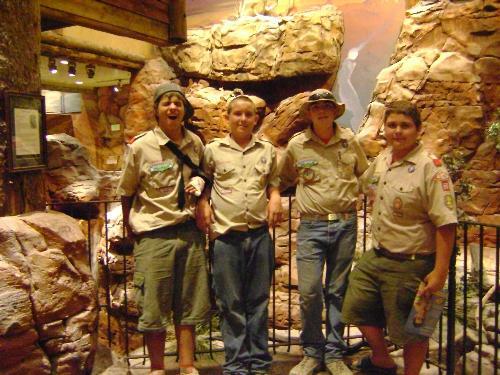 As a celebratory treat afterwards the boys were taken to the Bass Pro Shop in Las Vegas on the way back home. Jeepers creepers, where are you going to put any more awards? 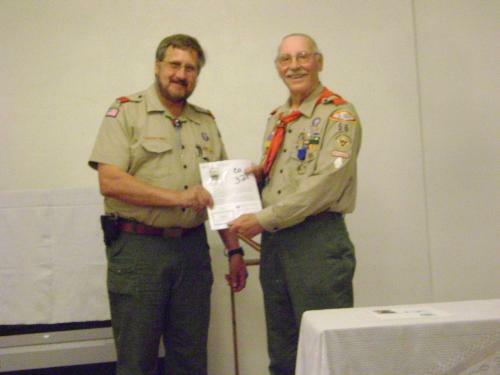 60 years in Scouting!Congrats, Doc! 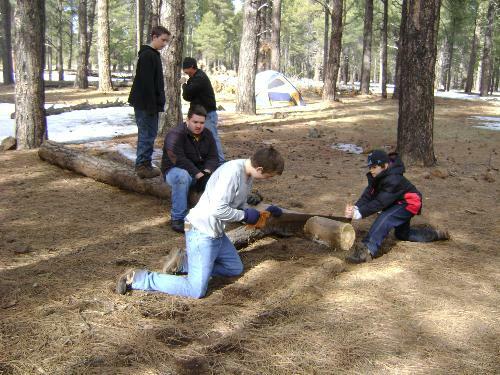 Our newest Scout 12 of our Scouts attended We had the 2-man saw station for the contest portion of the Camporee. 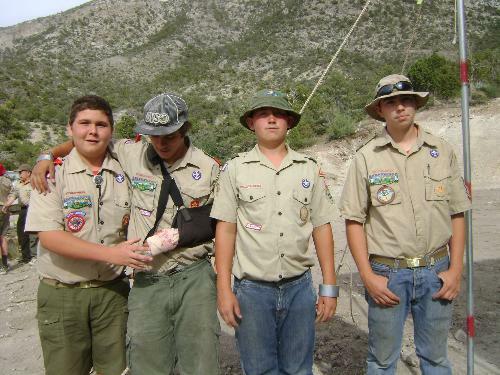 Troop 56 walked off with several awards for their efforts. 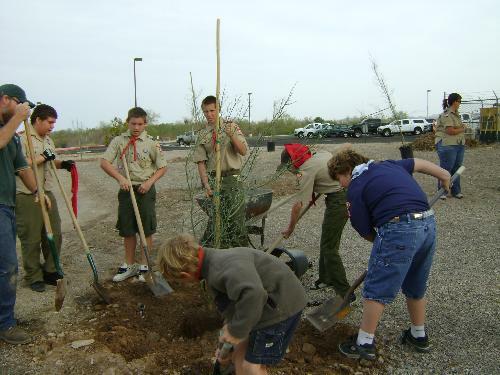 On March 19, 2011, our Troop gathered the forces and trekked off to Lake Havasu State Park, at Lake Havasu City, AZ, to participate in the restoration of the riparian region along the shores of the lake. 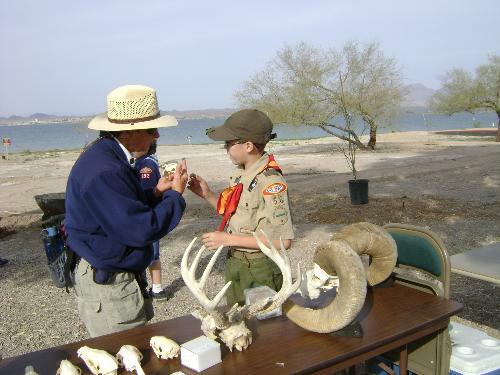 We were joined by Cub Scouts, Girl Scouts, local people and even winter visitors. 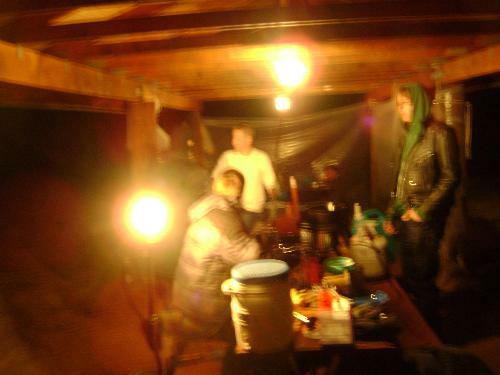 Here are a couple of pictures from that event. 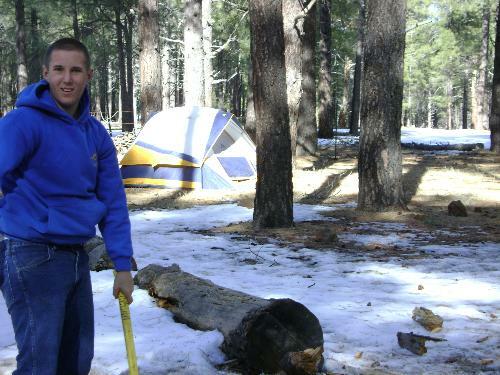 Paul Bunyan, or the Mighty Blue Ox? 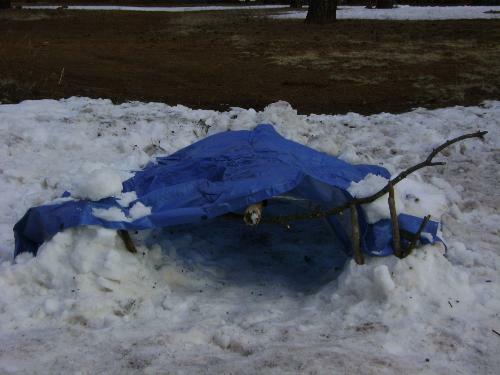 11 boys and 4 adults attended this campout. 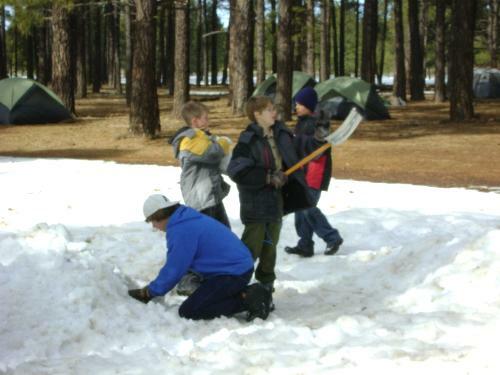 None of these boys had ever camped in snow before - not that there was a lot of snow, obviously. 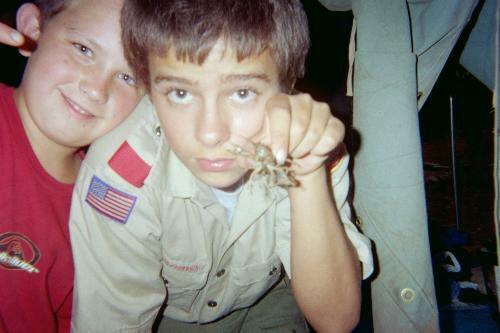 For two it was in fact their first campout with the Troop. 8 of 9 boys who attended, plus "Mom" 5 of our boys, representing 4 states! Did somebody say 'lunch?" 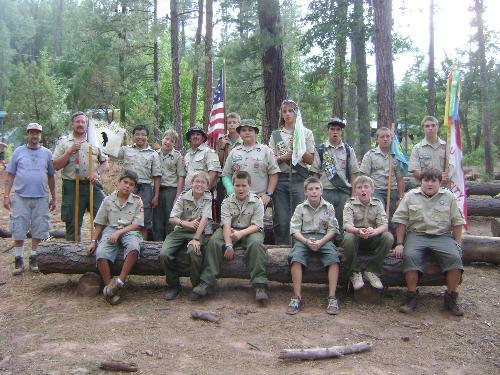 In 2009 we had Joe from Iowa, Kyle from upper California, Jeff from Laughlin, NV and several boys from Bullhead City and Fort Mohave with Troop 56, 9 campers in all. 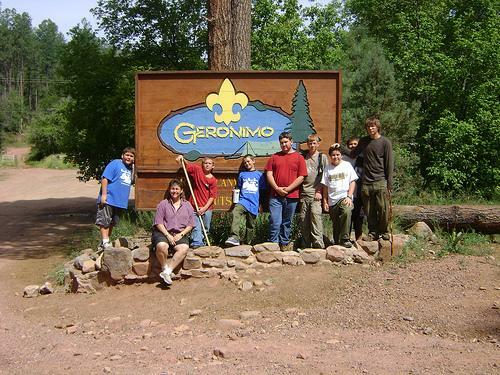 2008 was our first year at Camp Geronimo, but not our last. 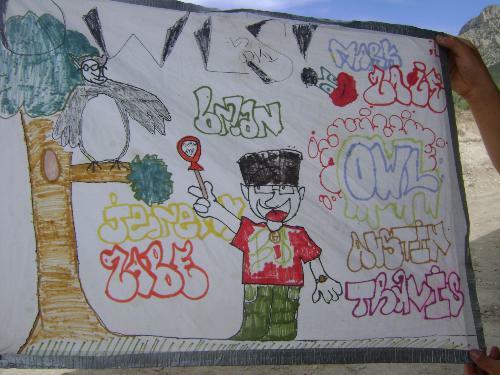 We returned in 2009, and will return once again for 2011. Crawdads: Yum, yum! 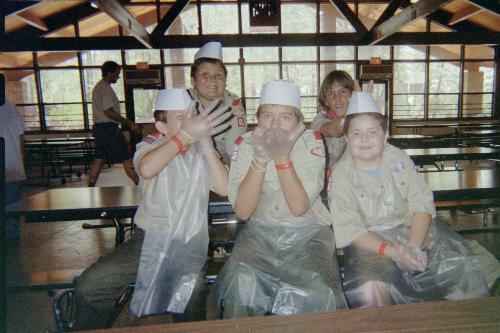 5 of our 7 campers that year. Dining hall isn't all drudgery. 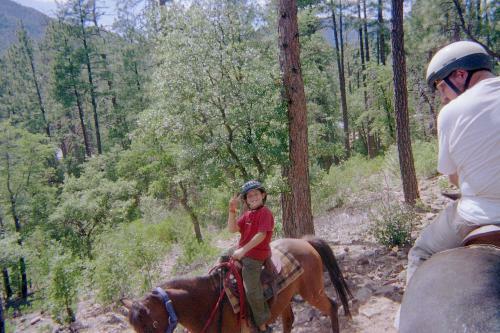 Bet he thinks he's a real wrangler now.